The Webb Family has been serving Chicagoland’s automotive needs for three generations. At Webb Automotive, we’re more than a business that sells vehicles, but a place that aims to spread awareness, contribute to the growth of our communities, and spread more joy. The world takes some, but when it gives back, it gives. As a company, we believe in giving back to our community and our employees. 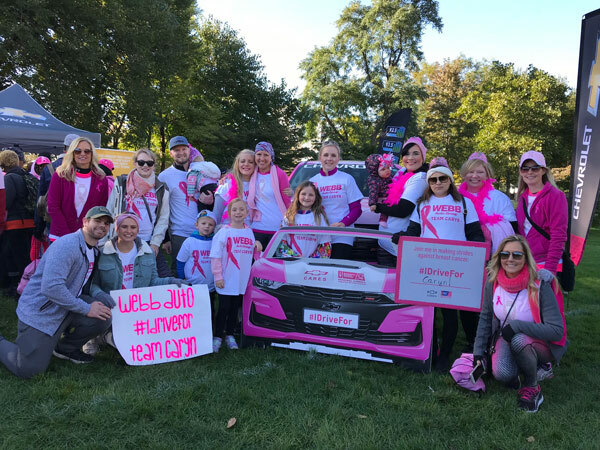 Whether it’s walking to find a cure for Alzheimer’s and breast cancer or cheering on your local little league team, change happens from the smallest of moments. Small moments like those are the greatest gift that we could give to our community and our employees. We know that a community and world filled with kindness and giving is possible, which is why we create that within our culture. Little moments are what we believe in to create a lasting print. As part of the Web team, you will also be expected to embrace our Core Values. Our Core Values are what define this organization. They will be use during the recruitment process to decide if you are the right fit for our company, and your ability to embrace them will help shape your future with us. Do the right thing. Nothing is worth compromising a relationship. Lead by example. Be willing to help no matter how difficult the challenge. Display positive energy. A good attitude is highly contagious. Be open minded. The only thing that is constant is change.